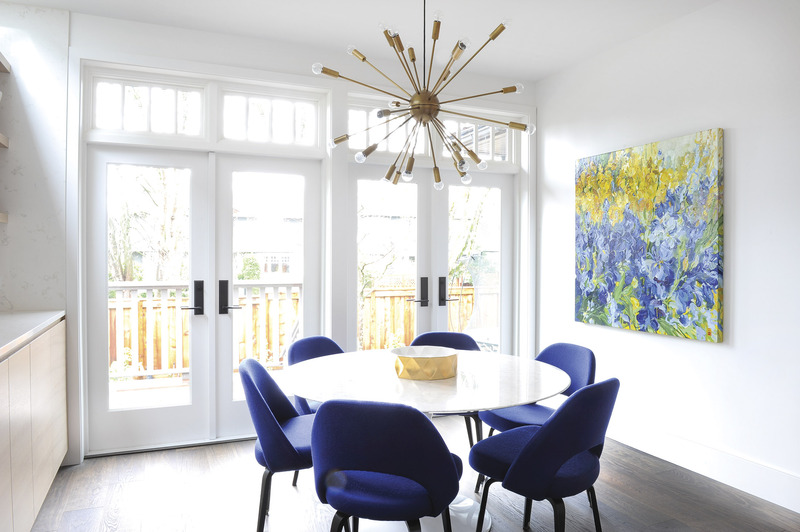 Call it “flower power.” It was the sprawling gardens on a Shaughnessy property that convinced its new owners that they had to buy this home, and then a painting of blue and yellow irises that inspired its redesign. Built in 1922, the home had been through a few renovations already, but to make it work for their family, the new owners decided to gut it and make it grow in almost every direction. They added an extension to the back and onto one side, installed dormers that added height, and dug out the basement so they could raise its ceiling height to 11 feet to accommodate a golf simulator. The home was expanded to 4,700 square feet from its original 3,300. 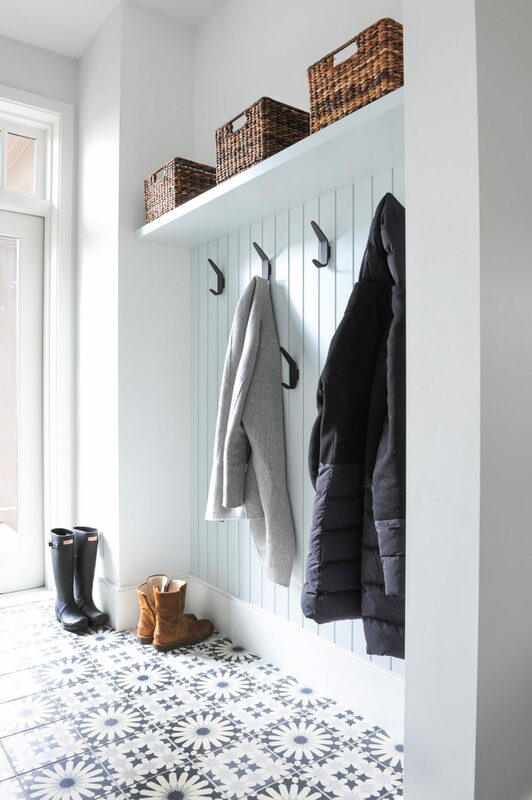 One of the biggest surprises for the homeowner is how much she appreciates the mudroom with all its storage and hooks. 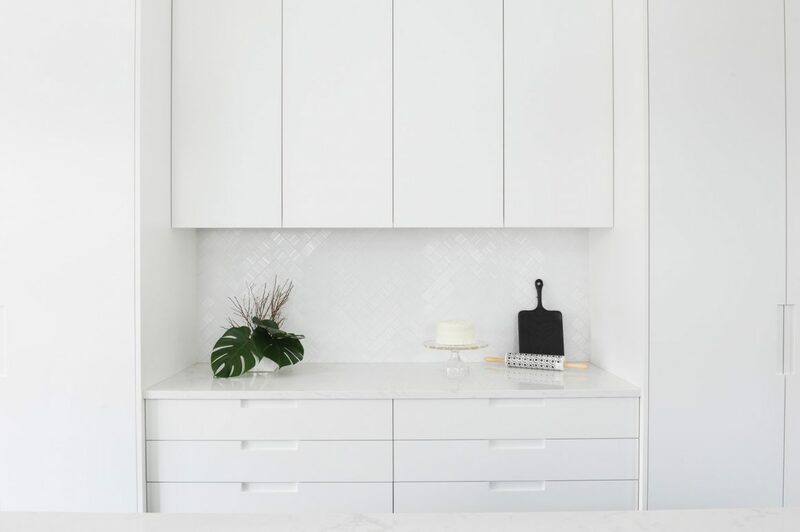 “It’s the tiniest room and the most striking and the most functional,” she says. 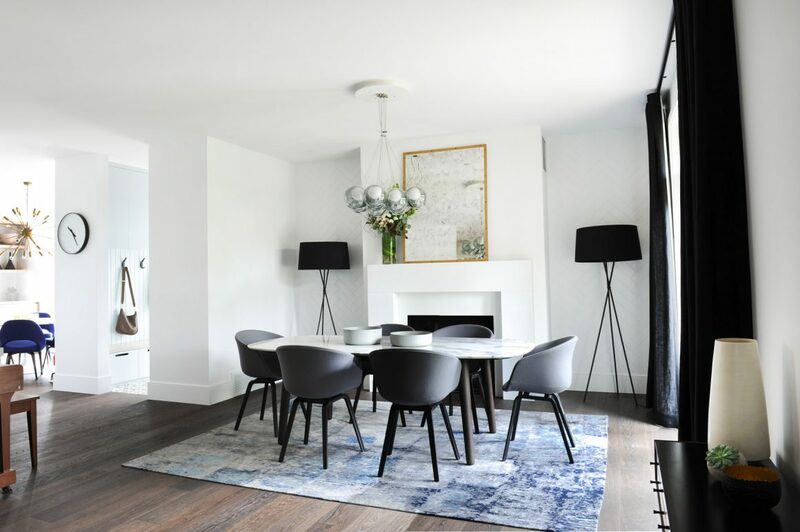 The traditional wood panelling has a contemporary profile, and matte black hooks match the matte black in the patterned floor tiles from Ann Sacks. Several of the old photos they found, including one of a home down the street, showed the same striking front door, in a shape they’d never seen. The top was rounded like an arch, then came to a point at the top. The homeowners fell in love with it and had one custom-made by Mountainview Designs. “Everybody comments on it, and when we put it in, even the tradespeople working on the house were talking about it,” she says. The inspiration for the children’s bedrooms came from quilts made by their grandmother when they were born. “We’re a family that loves to make things for each other,” says the homeowner. 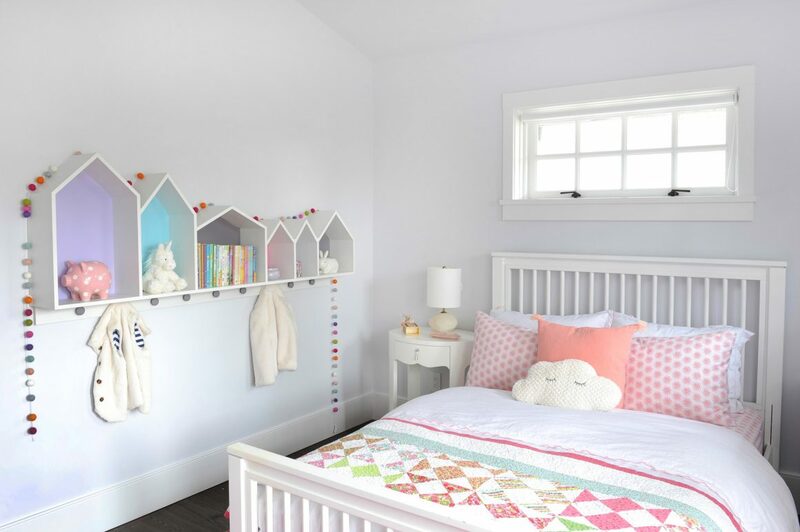 “I have all these things and I was wondering, how am I going to mix it with a modern home?” She loves the way designer Janie Hungerford incorporated some of those colours and built her daughter’s and son’s rooms around those special keepsakes. The kitchen prep and eating areas are across the hall from the dining room and extend into the great room where the family spends most of their time. “It’s where all the toys get brought and where everything happens,” says the homeowner. 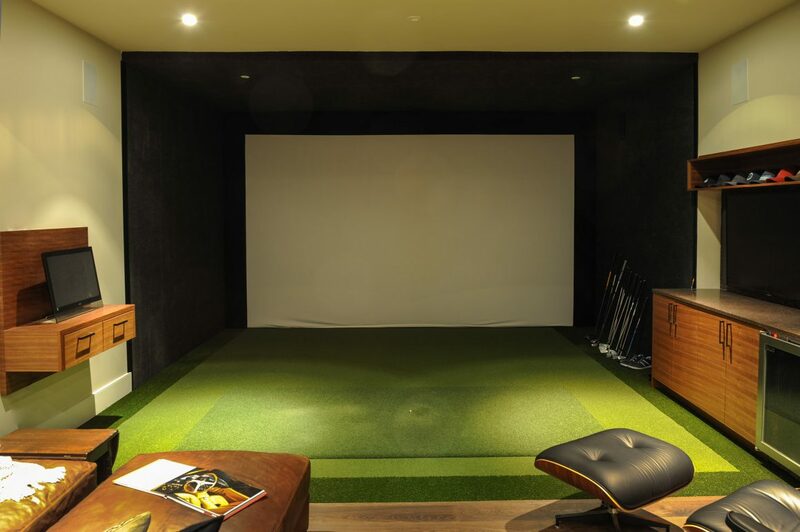 “We all like to be in the same area.” So even though her husband has an almost floor-to-ceiling screen with his golf simulator downstairs, the family always seems to gather upstairs to watch TV together. 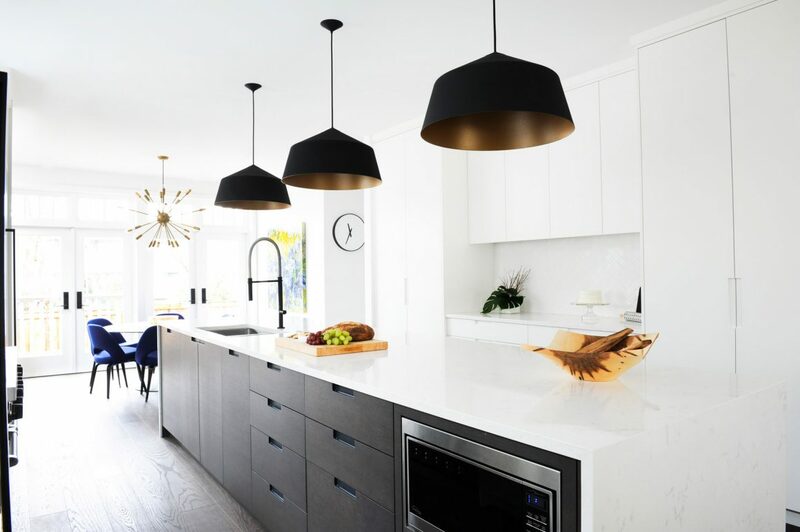 The dining room is the first thing visible to those entering the home, so designer Janie Hungerford wanted a sophisticated look here, but one that wouldn’t be too formal. 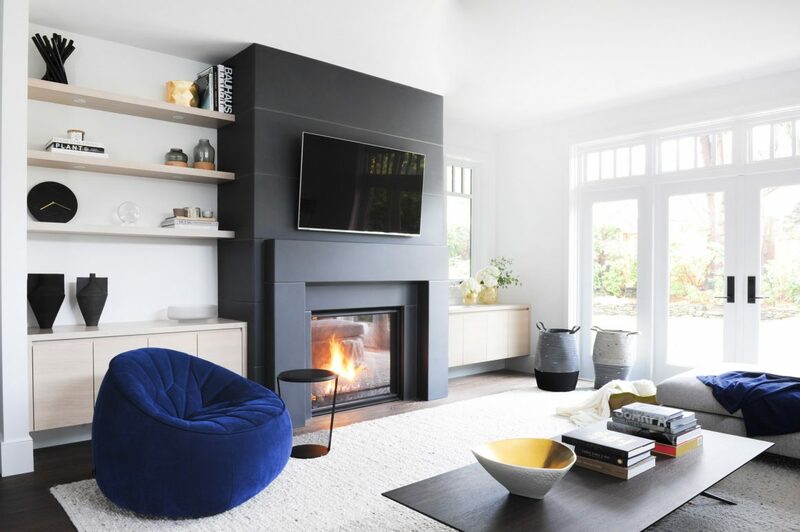 Wood in a subtle herringbone pattern surrounds the fireplace; it was painted white and adds texture to the walls. Chandelier: Bocci. 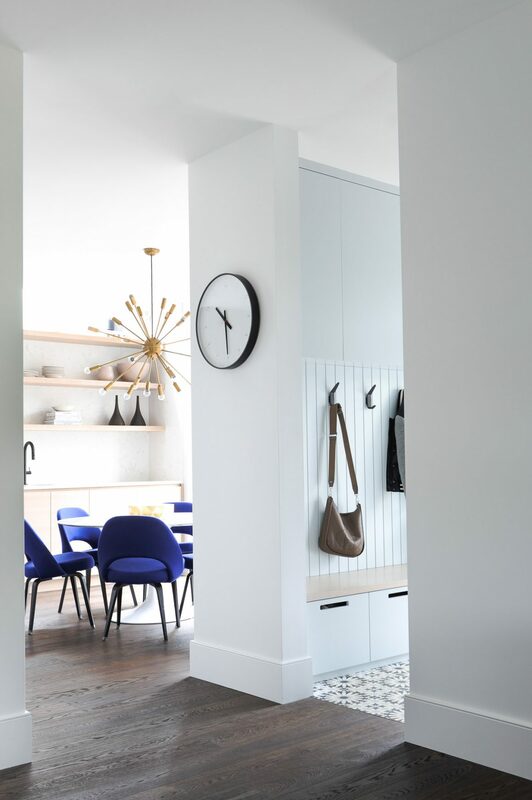 The blues in the painting by Bobbie Burgers inspired the colour of the chairs in the kitchen’s dining nook. The painting’s colours were also carried to other parts of the main floor. 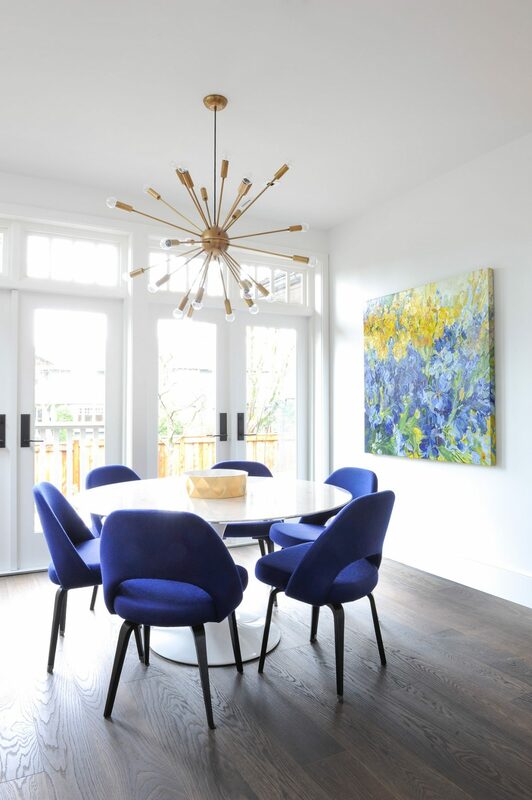 Satellite chandelier: Design Within Reach; Saarinen executive chairs: Livingspace Interiors. 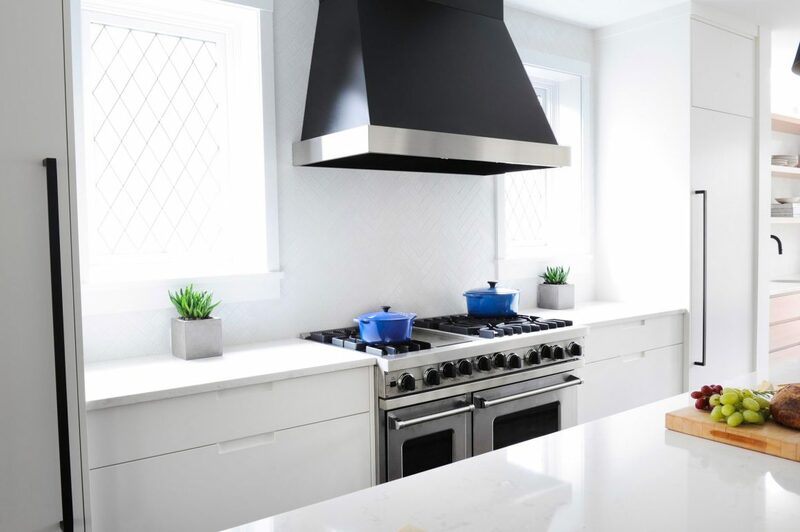 The windows over the counter are original to the house; they’re one of the features the homeowner loved and wanted to preserve. 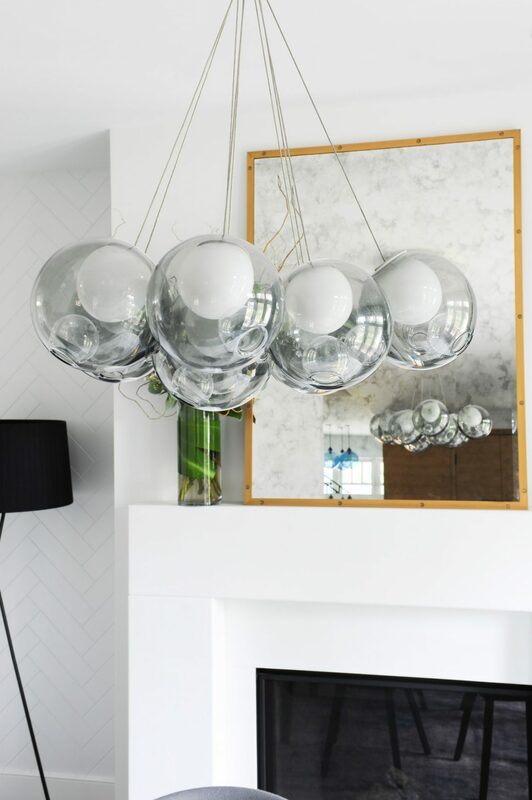 Circus pendant lights by Innermost: LightForm.